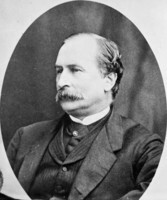 TUPPER, CHARLES, Baptist minister, educator, and author; b. 6 Aug. 1794 in Cornwallis Township, Kings County, N. S., son of Charles Tupper, a farmer, and Elizabeth West; m. first in 1818 Miriam Low, née Lockhart, and they had five children; m. secondly in 1852 Mary Miller; m. thirdly in 1868 Betsy Knowles, née Dimock; d. 19 Jan. 1881 at Tremont, Kings County, N. S.
Charles Tupper’s parents had immigrated to Nova Scotia from Connecticut in the early 1760s. After farming for a short time, Tupper in 1813 began teaching in Cornwallis, although his own formal education was limited. 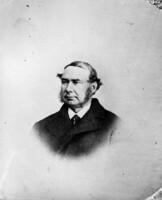 The Tupper family had been Presbyterian but came increasingly under the influence of the Reverend Edward Manning*, the Baptist minister at Cornwallis. Following a period of great doubt and uncertainty, Tupper went through a conversion experience in February 1815 and was baptized by immersion on 14 May of that year. His conversion profoundly changed his life as he felt an almost immedate call to the ministry. He began preaching in 1816, since at that time there were no formal qualifications for the Baptist ministry in the Maritimes, and on 17 July 1817 was ordained by a council composed of laymen of the Horton and Cornwallis churches and the ministers Edward Manning and Theodore Seth Harding. Tupper’s active ministry lasted for 55 years, during which time he held pastorates in Nova Scotia, New Brunswick, and Prince Edward Island. He remained only a short time at most of these places and frequently returned to the Amherst, N.S., region where after 1821 he maintained a home and small farm. While serving on these pastorates, he often taught school to augment his meagre and uncertain minister’s salary. A meticulous man, Tupper kept careful account of his activities and at the end of his career was able to record that in his ministry he had preached 8,191 sermons, attended 7,482 church-related meetings, and made 16,585 visits to church families. 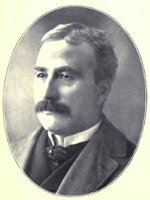 Tupper’s chief importance to the Baptist denomination, however, lay less in his pastoral work than in his other church-related activities. In 1824 he began to advocate total abstinence, a view that would not be popular in the Maritimes for a number of years. 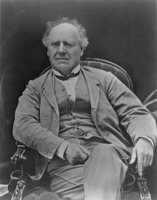 He established some of the first temperance societies in Nova Scotia and New Brunswick in 1829–30, and remained a devoted advocate of the principle for the rest of his life. In 1825 Tupper had begun his writing career, an activity that would occupy increasingly large amounts of his time. Realizing the growing importance of the press, he was foremost among those who advocated the establishment of a denominational paper to present the Baptist viewpoint and to act as a link for the scattered Baptist communities. When in 1826 the Baptist associations of Nova Scotia and New Brunswick agreed jointly to sponsor such a publication, Tupper was appointed first editor of the Baptist Missionary Magazine of Nova-Scotia and New-Brunswick (Saint John, N.B. ), a post he held from 1827 to 1833. For the rest of his life he regularly contributed articles on temperance, education, missions, and Baptist history to church newspapers in the Maritimes, becoming one of the major apologists of the faith. 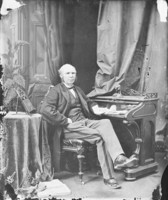 He was also a leading advocate of Baptist union and was instrumental in the formation in 1846 of the Baptist Convention of Nova Scotia, New Brunswick, and Prince Edward Island. Tupper seemed happiest during his frequent tours through the Maritimes, when he preached and collected subscriptions for the magazine or funds for the Nova Scotia Baptist Education Society. In June 1825 he became the first ordained Baptist minister from Nova Scotia to visit Prince Edward Island. He made another tour of the Island in 1827 and in 1833–34 served as pastor of churches in Bedeque and Tryon. He was also deeply interested in education. 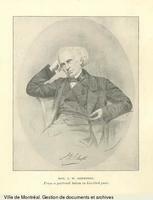 Possessed of a fine mind, he virtually educated himself; by 1859 he had developed a reading knowledge of ten languages. As early as 1824 Tupper had urged the establishment of an institution of learning for Nova Scotia Baptists who were at the time excluded from Anglican King’s College in Windsor. As first vice-president of the Baptist Education Society, he was a key figure in the establishment in 1828 of Horton Academy in Wolfville, N.S. When ten years later the academy was expanded to become Queen’s (Acadia) College, Tupper worked with Edmund Albern Crawley and others to support its growth. 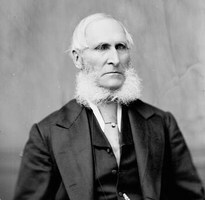 In addition, in 1838–39 and again in 1842 he served as interim principal of the Fredericton Seminary, the co-educational school of New Brunswick Baptists. 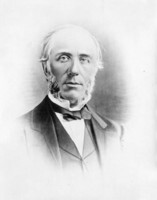 In 1857 Acadia College awarded him the honorary degree of dd. Tupper was one of the earliest advocates of an active role for Maritime Baptists in the foreign mission field, especially in Asia, and for many years he served on the Baptist convention’s Board of Foreign Missions. Among Tupper’s writings were books and pamphlets, including Baptist principles vindicated: in reply to the Revd. J. W. D. Gray’s work on baptism (1844), a militant defence of his church’s mode of baptism, and Prohibition and anti prohibition: being a series of letters . . . in favor of prohibition, and replies to the same, by John Bent (1856), which illustrated the Baptist view of temperance as a religious issue. He sometimes became embroiled also in political controversies, and in 1817 was accused of “vasalating hypocritical” conduct because he had spoken his mind freely concerning the candidates and issues in a Cumberland County election. 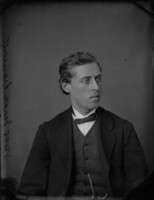 His son, Charles*, was to become a leading Conservative in Nova Scotia and Canada. 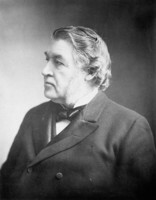 Charles Tupper was the author of Baptist principles vindicated: in reply to the Revd. J. W. D. Gray’s work on baptism (Halifax, 1844) and Prohibition and anti-prohibition: being a series of letters . . . in favor of prohibition, and replies to the same, by John Bent (Saint John, N.B., 1856). Further works by Tupper are listed in “Manual of Baptist authors,” comp. W. E. McIntyre (5v., typescript, 1905) at Acadia Univ. Arch., Atlantic Baptist Hist. coll. Atlantic Baptist Hist. coll., Edward Manning corr., 1778–1859. PANS, MS file, “Cumberland squabbles” (letter from A. S. Blenkhom, Minudie, to the Reverend Charles Tupper re voting, 25 June 1837). 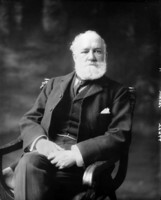 Christian Messenger (Halifax), 1863–81. The Acadia record, 1838–1953, comp. Watson Kirkconnell (4th ed., Wolfville, N.S., 1953). Eleanor Tupper, Tupper genealogy, 1578–1971 (Beverly, Mass., 1972). I. E. Bill, Fifty years with the Baptist ministers and churches of the Maritime provinces of Canada (Saint John, 1880). T. D. Denham et al., The history of Germain Street Baptist Church, Saint John, N.B., for its first one hundred years, 1810–1910 (Saint John, 1910). A. W. H. Eaton, The history of Kings County, Nova Scotia . . . (Salem, Mass., 1910: repr. Belleville, Ont., 1972). M. A. Gibson, Along the King’s highway (Lunenburg, N. S., 1964). G. E. Levy, The Baptists of the Maritime provinces, 1753–1946 (Saint John, 1946). R. S. Longley, Acadia University, 1838–1938 (Wolfville, 1939). Memorials of Acadia College and Horton Academy for the half-century, 1828–1878 (Montreal, 1881). E. M. Saunders, History of the Baptists of the Maritime provinces (Halifax, 1902). 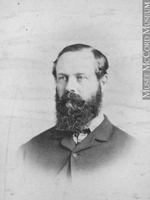 Barry M. Moody, “TUPPER, CHARLES,” in Dictionary of Canadian Biography, vol. 11, University of Toronto/Université Laval, 2003–, accessed April 24, 2019, http://www.biographi.ca/en/bio/tupper_charles_11E.html.